Flat. That’s sort of how the market has felt in Placer County. Well, there has been a slight uptick lately, but otherwise the market seemed to level out a few quarters ago after a massive stint of appreciation. Let’s take a look at the latest trends below, and touch on what is happening in the regional market too. I hope this is helpful. The market has felt much more flat in Placer County compared to Sacramento County. The median price and average price per sq ft did see an uptick last month on paper, but by in large values have been somewhat flat overall. The market has felt very price sensitive in that if a property is not priced right, it’s going to sit. Of course not all cities or places in Placer County are experiencing the same trends, so take county-wide stats with a grain of salt since they do not apply across the board to every market niche. The higher the price, the more inventory there is. Right now inventory is at 2.5 months for Placer County, which is about the same as it was last month. There are actually more listings this month (which is normal), but there are also more sales (also normal). On average properties took 54 days to sell in May compared with 55 in April (cumulative days on market). 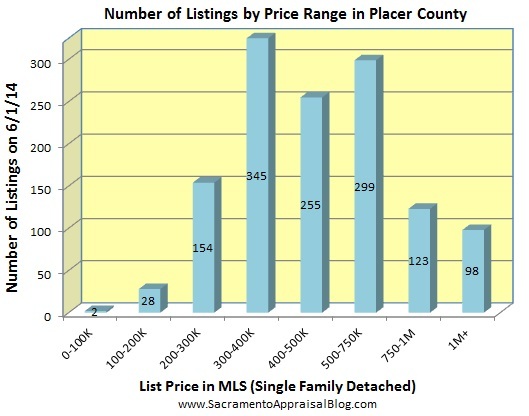 Just as it is in Sacramento County, the same holds true in Placer that higher-priced listings take longer to sell. Sales volume is up by 15% from last month, but for some perspective it is down 12% from May 2013. Nonetheless, it’s been good to see more sales these past two months after a more sluggish start to the year. This is what the market looks like in terms of listings in Placer County. There is very little for sale under $200,000, but quite a bit between $300K to $750K. What is driving the market in Placer County? Low interest rates and low inventory are two of the bigger “layers of the market” right now. Values really leveled off last summer after cash investors began to pull back from the Sacramento Region and inventory increased. Cash investors were far more dominant in Sacramento County during the heat of the market last year, but you have to remember cash had a ripple effect throughout the market, and what happened in Sacramento County impacted surrounding counties too. Interestingly enough, Blackstone is still buying properties in Placer County. Their purchases have been fairly minimal in 2014 in Placer County, but virtually non-existent in Sacramento County these past six months. The job market is also a factor in Placer County as we need to see higher paying jobs to support higher values. The unemployment rate as of April 2014 in Placer County is 6.1% (compared with 7.1% in Sacramento County). For reference, there is about a $100,000 median price difference between Placer County and Sacramento County. Keeping an eye on regional trends is important for context. When considering Sacramento, Placer, Yolo, & El Dorado County, inventory saw a slight uptick from last month and is now hovering at 2.23 months for May 2014 (still very low). The higher the price, the higher the inventory. There was no change in CDOM from last month to this month. On average properties are taking 52 days to sell (which is about 40% longer than last year). This is evidence of a market that has really changed these past few years. There are increasingly less listings available under $100,000 since the market is no longer saturated with REOs, and values have simply risen exponentially. What makes real estate values move? I often ask this question when speaking at real estate functions, and it’s interesting to hear the responses. I usually start by showing a photo of Luke Skywalker with the caption, “Luke, use The Force to make value move.” Then I ask, “Is that sort of like what appraisers do? Can they make a market move depending on how they appraise properties?” We all know changes with interest rates, housing inventory, the economy, or cash investors can definitely influence property values. That’s obvious. Yet when asking the question, “Do appraisers make values go up or down?”, there is often a bit of hesitation. What do you think? How would you answer this question if a client asked you? Do appraisers make the market move or not? There are so many “forces” that impact real estate values. In fact, if you’ve been around this blog long enough, you’ve heard my schtick about how real estate is like a multi-layered cake since there are many “layers” in a market that impact or create value. Check out the cake below to get more fully what I mean (this is an updated image). Yet it’s still easy to think appraisers are the ones making a market move since they are the ones appraising properties at higher levels. Unless there is fraud going on though, the higher appraisals are really a result of the layers of the market having changed. It’s not appraisers pushing the market up, but rather the market moving and appraisers simply interpreting that change. Think about 2012 when the market hit bottom and values began to increase quite rapidly – especially in early 2013. If anything, during this most recent boom, appraisers were accused of appraising properties too low rather than inflating values. An Example of 1% interest rates: Imagine if interest rates hit 1% tomorrow. What would that do to home prices? First off, the market would be instantly flooded with buyers because of how much more affordable it just became to borrow money. This would create intense competition resulting in a dramatic lowering of inventory, which would inevitably increase prices because of the scarcity of property. In the midst of shifting “layers” of real estate, appraisers would rightly be appraising properties at higher levels since the market is now hands-down willing to pay those prices. But appraisers didn’t actually move values higher, did they? They simply interpreted the market that changed. There are many forces that impact value in a real estate market. Memorize the cake analogy so you can use it with your clients and speak definitively about what is making value move in your market. Appraisers interpret the market rather than move it. Appraisers are more like a measuring tape than a gas or brake pedal. A market does not need appraisal fraud to see values increase. This idea tends to float around the real estate community, but it’s a misunderstanding of what really drives real estate. By the way, I’ll post more specifically on Sacramento market trends next week. Be on the lookout for some stellar graphs to use for your newsletters and emails to clients. NOTE: Appraisal fraud and low appraisals could certainly be a layer in the cake above, but fundamentally appraisers are not drivers, but interpreters. That’s my main point. We could easily talk about fraud or even whether appraisers are doing a good job interpreting the market or not, but that’s another post. Questions: What else makes real estate values move? Any appraisal stories or insight to share?